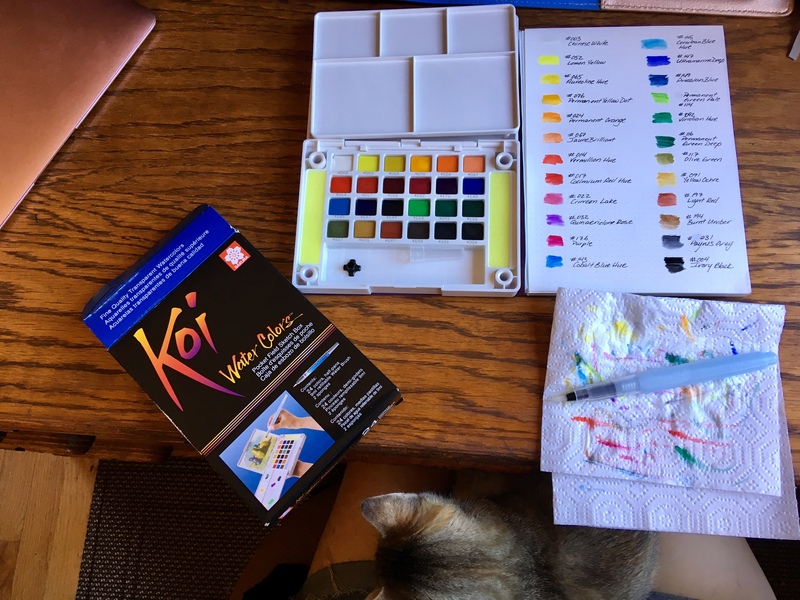 This morning I was so excited to get up and play with the watercolor set I got myself. It is the Sakura Koi Pocket Field Sketch Box. I’ve heard it recommended by quite a few planners, art journal keepers and artists on YouTube. The best part was using a 50% off coupon. This one is the 24 color set and it looks to have more than enough to keep me going. I’ve been using my Tombow markers, but this is something I wanted to learn how to use, especially since it gives me a greater range of color saturation and dilution. I only have three of the Tombow sets and it does limit my color choices. I took a little time this morning swatching all the colors on some Fariano dot grid paper I have. Yes, ‘Lanta spends her morning napping in my lap while I do my planning and journaling. Today is one of my favorite types of days. I get to spend the whole day at home, just working on the property and the house. I really am a homebody. I swear, if it weren’t for the kids activities, I would only leave to go grocery shop once a week. We are still in the thick of harvesting chestnuts and cleaning up the fall leaves. The trees are only half through shedding and the it is a daily job keeping up with it. To top it off, the wind has really kicked up over the past week. What we need now is some rain. There is currently a 17 acre fire burning on the other side of the range from where we live. Even a heavy fog would be welcome at this point. What about you guys, have you had a good fall? Have you started something new? or is the approaching holiday season the only thing you are gearing up for? Please post to the comments. I’d love to hear how others are spending their fall. 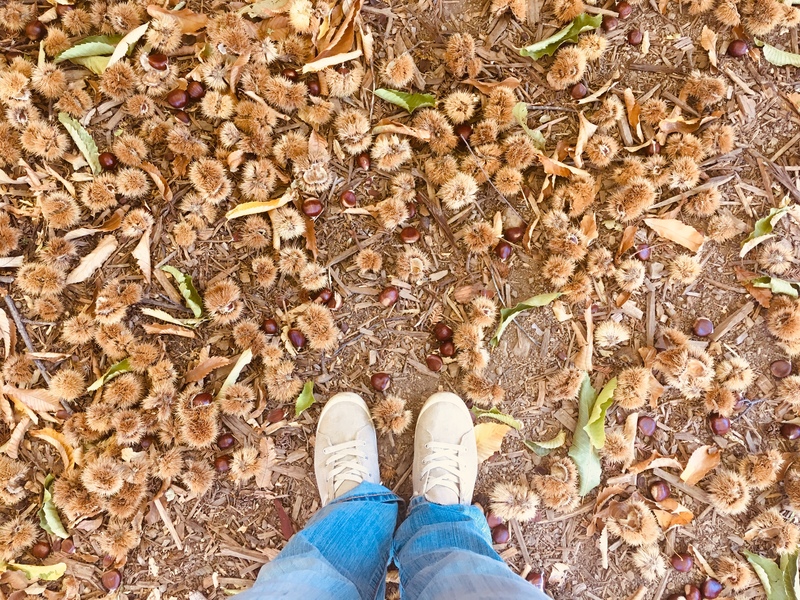 The first of our four chestnut trees have started to drop nuts. I can already tell you I’m going to be eating a ton of these! They are sweet and perfect. I’m also going to start looking up chestnut flour baking recipes. It’s a perfect alternative to our Celiac household. So, I had a post I started to write, between putting together Ikea furniture for the kids’ bedrooms (Am I the only one who likes doing that? It’s like giant Lego sets!) and getting the house cleaned up for my parents’ visit next week…. ….and then the water stopped running and we realized the well was not working. Right now I am just too tired to say anything more. We got everything working, and I will write it all up once I get a chance. On the up side of things, I finished my Rikke hat. YAY! Nights here are going to be in the 40s next week, so it will be great to wear it while I drink my coffee and watch the sun rise over the vineyard. Talk about a game of yarn chicken! That tail is all that was left of the skein. Cassie-girl loves it out here. I love having my morning coffee out here. This old tractor was set up at a lawn ornament by a previous owner. I just love it! We also have a few other antique farm pieces around, some of them we can’t even recognize. The first fruit in the orchard…I just wish I knew what it was! I guess we’ll find out soon enough. Oh, my! This stuff is a menace. And. It. Is. Everywhere. Every day, I try to get out there with a pair of gloves and I just pull, pull, pull. They have to be pulled out by the roots or they come back. The worst ones are the ones that grow from the cut stumps that were not pulled. Some of those I can’t get out at all. I am loving doing it though. The day was sunny and warm, the breeze cool. When I pulled the root of the plant out, I could smell the damp earth. Sometimes even tasting the scent in my mouth when I breathed in. Sun on my skin. My muscles working hard. I found myself using “deadlift form” when I pulled the big ones out. Flat back, shoulders straight, pushing through my heals. Tomorrow morning my hamstrings are going to feel this. It’s going to feel good. Functional movement at its finest. This side of the vineyard had some damage during the Loma Fire in 2016. The fire department actually worked hard to save this property, but trees still came down on the fence and some of the vine posts got pulled down. I’ve managed to work my way down the fence. I’m only about half-way, but the recent rain and humidity makes the soil have more give. Hopefully I can get the majority before it all dries out. So we just had our first blackout. It only lasted about half an hour, thank goodness! We have not yet gotten a generator. The giant diesel one on the property was fried long ago. We just lit some candles and the kids decided to make a “prepper” list of things we need to do if this was a serious situation. LOL! Sitting around talking in the candlelight was a great way to end the day. Here are a few photos I took of our day. Have a great night everyone! Bone broth I made in the crockpot overnight. A walnut. We do have a walnut tree, but it is far from where we found this one. Maybe a bird or a squirrel carried it. Breezy thought it looked like a little owl. Spring leaves on the oak (?) tree! I have no idea what this bush is, but those are some looooong thorns! Cassie-girl taking a break after she chased the kids around on our morning walk. Oh! What a night. At midnight, we got up to find the smoke detector that was losing battery. The beeping drove poor Cassie-girl into a quivering, whimpering mass. Fortunately, we finally figured out how to turn on the heat. At least we weren’t freezing our buns off at midnight, while we got the beeping to go away. I guess I’ll be adding 9 volt batteries to the list of things I need to get while in town today. Tuesdays are always our busiest and latest day. Usually I’m pulling into the drive around 7 PM. With a high of 55 today, I think a crockpot full of stew is going to be just the thing to welcome us home! I am still trying to learn my way around this new house. There is so much to do! Not just the everyday cleaning, cooking and chores that come with a home and kids and pets, but also the unpacking and general cleanup any new move requires. When there are almost five acres worth of cleanup it’s a whole different story. I told Doug that we a a little out of practice as homeowners. We’ve been renting so long, the list of tasks as a homeowner and fledgling homesteader looks ginormous! The weather is proving to be just a bit crazy around here! This is the middle of April…in California…right? Hello, dear blog. I’m so sorry I’ve neglected this space, but I had my reasons. Please, hear me out. You see, dear readers, I (and D) have had a dream for a very long time. We have dreamt of a place where we could breath the fresh air. A place where wildlife is but a step away. A place were we could grow food, tend to our own animals, and let our children roam the land. A place were the city lights are far enough away to see the Milky Way stretched out above our heads on a clear night. A little homestead where we could steward the natural beauty around us. We always thought we would find that place once we returned to the East Coast. We have searched Landwatch and United Country for years, looking for the perfect place. However, we knew with D’s job, that staying in the Bay Area would be a smarter move until we were ready to retire to our country dream. But, have you seen the prices of rent and mortgages around here?! Oh! They are crazy. Just. Nuts. Then, we were given the golden opportunity to live in a tiny (800 sq ft) cottage in the Santa Cruz Mountains. We loved the last two years there. D was able to work in town, but we were able to enjoy the quiet of country life. At the end of last month, we became the owners of an almost five acre homestead in the Santa Cruz Mountains. The view you see there is of the Santa Clara Valley. There is a lot more to this story, of course. It was a whirl wind process! The deal went down in only 30 days. The fact it was the first property we looked at and then we got it is, from my understanding, unheard of in Cali. I truly believe we were meant to live here. So many things happened to make it possible, it was like the Universe aligned the planets, just to we could be here. Anyway, I finally feel I am ready to return to this space. I’ll be posting more often, and as we settle into this space, I will show y’all around. I am a writer, artist, and mother pursing the Creative Life. I spend my days in the Santa Cruz Mountains homeschooling my two kids, knitting, spinning, drawing, writing , and photographing. This blog is a reflection of my days.